Click a photo to see a larger view. Please send your comments and corrections to Steve. 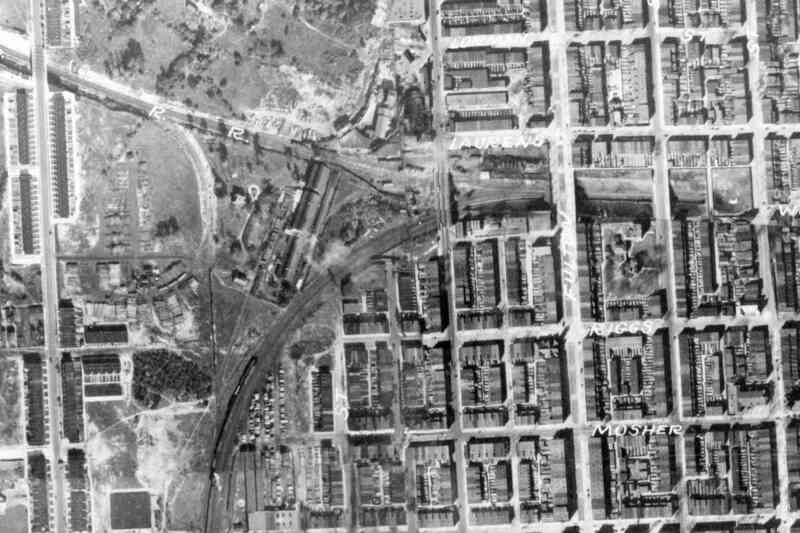 Aerial photos courtesy Johns Hopkins University. 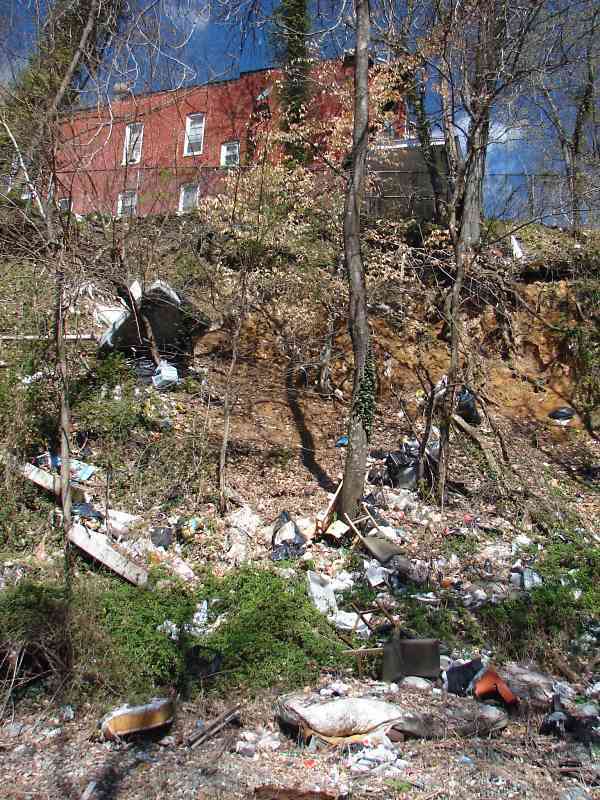 As the WM ascends out of the Gwynns Falls valley it cuts through a ridge and, as at other cuts, becomes a trash dump. 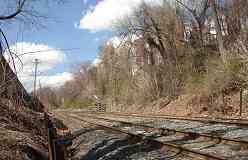 When I lived near a railroad cut like this instead residents planted vegetable gardens on the sunny slopes. 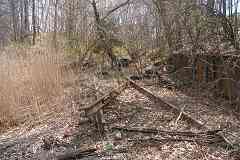 Oh, there was some trash too, but the gardeners would clean up the vicinity. You say the hill's too steep to climb? 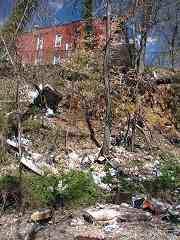 Erosion at Longwood Street is undermining the street above, and growing closer to the end house. 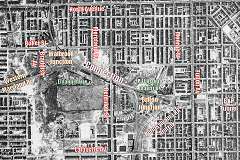 The Baltimore neighborhoods currently suffering the most align with areas in which affordable housing was built during the 1910s and 1920s. Such houses when new typically attract first-time buyers starting families. The timing was such that when the children of those families reached their teens and twenties the Great Depression hit, greatly limiting job opportunities. When funds are limited maintainance is deferred. 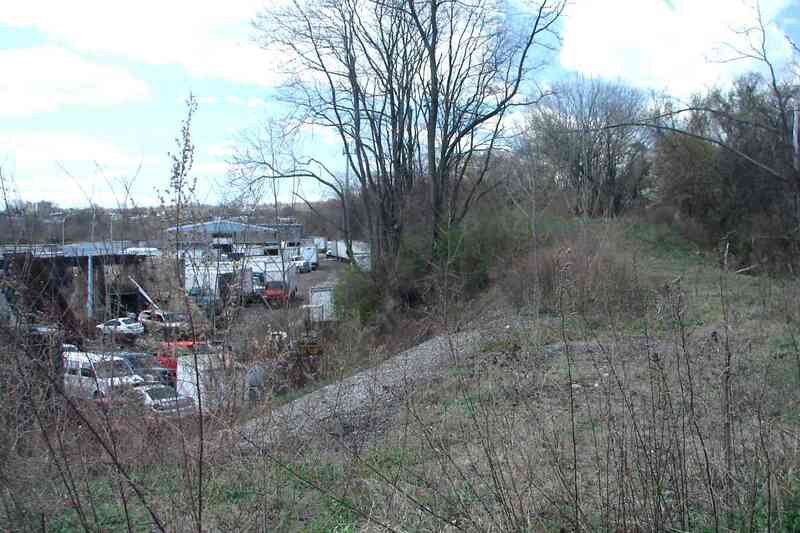 In the impacted neighborhoods deterioration remains evident today, compounded by a loophole in Maryland's tax sale law that encourages houses to sit vacant for years. 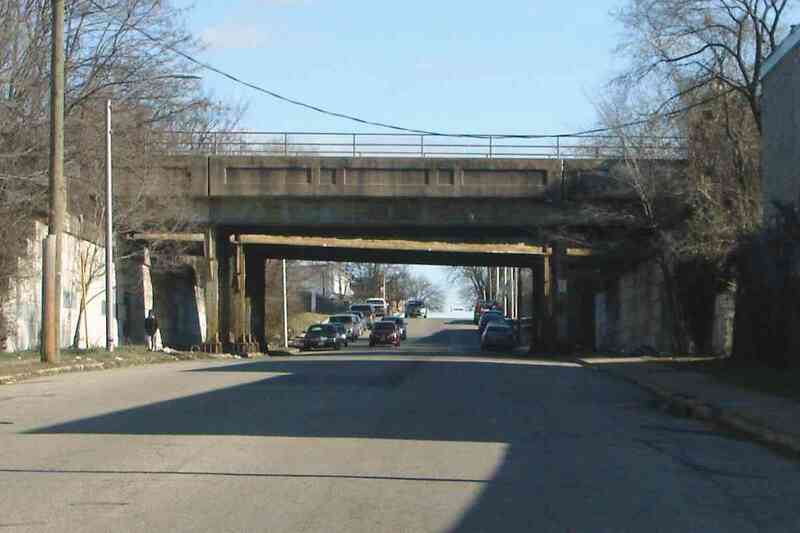 Next up are two road bridges rehabbed within the past 10 years, those for Bloomingdale Road and Poplar Grove Street. 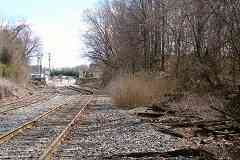 Since Franklintown Road, about 1800 feet back, the railroad has ascended 36 feet, a 2% grade. The climb out of the valley continues ahead. This is another spot that people slide a rind down behind. 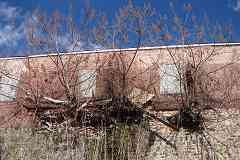 It is impressive how these trees survive(d) a southern exposure with virtually no soil. I'll stop before this becomes one of those annoying motivational posters. The gap in tall trees at photo center represents the former location of the south leg of the Walbrook Junction wye. Farther below on this page is a photo of the same leg from the opposite direction. The nearby yellow poles mark where the tracks have ascended enough to climb over streets again, in this case Braddish Avenue. Everything is green and submarine at Braddish Avenue. A few more trees and you'd not know a railroad is here. 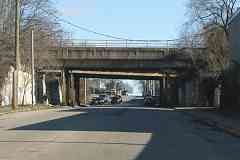 Around the corner from Braddish Avenue, Baker Street passes under an unusual pairing of bridges. The bridges belong to different legs of the wye at Walbrook Junction. 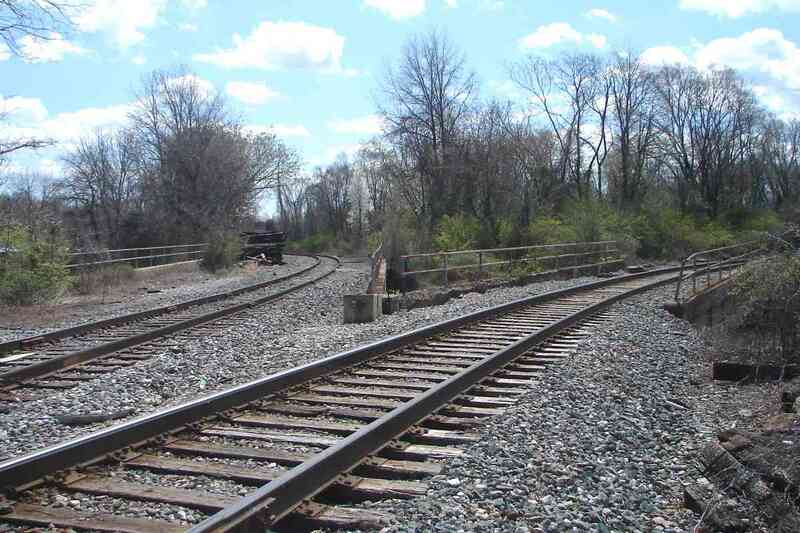 You may wonder, as did I, why the wye was not shifted slightly south (right) so that only one bridge would be needed. 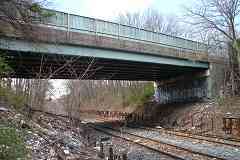 After all, both bridges appear the same age. 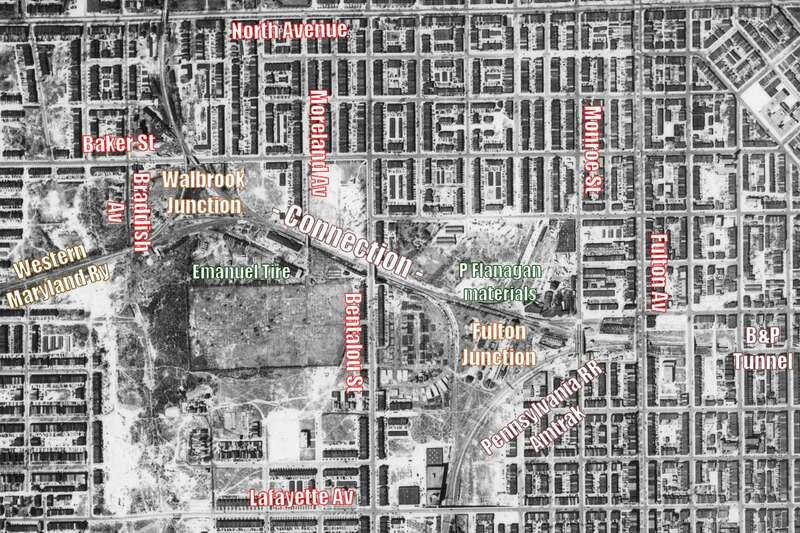 I surmise the answer is the different subdivisions represented by the bridges originated during different eras. The closer bridge is part of the WM's Tide Subdivision this tour has been following from Port Covington. 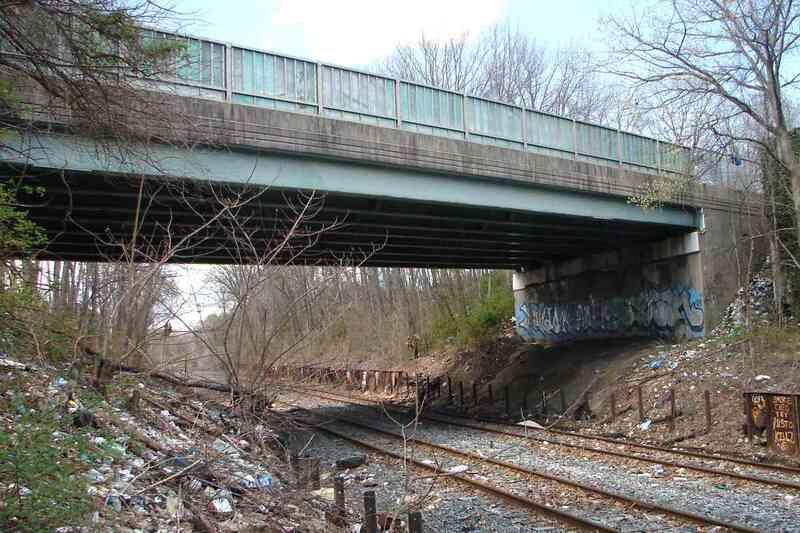 The Tide Sub was not added until 1904, whereas the main line into Baltimore, represented by the farther bridge, dates to the 1850s. 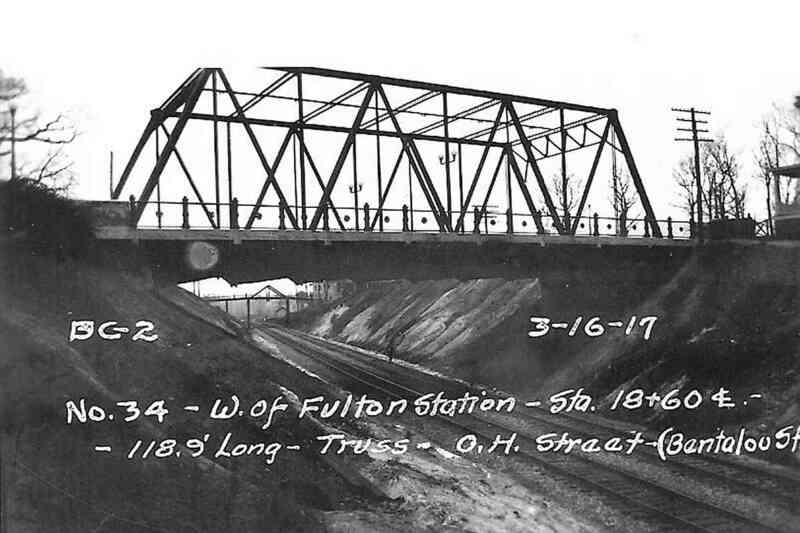 When the Tide Sub was constructed it got a brand new bridge while the main line's already-existing bridge was rehabbed. Ahead is the same bridge over Baker Street as seen from Tide Sub track level. 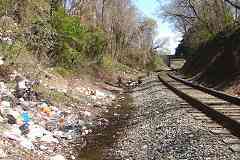 The bridge of the WM's former main line into Baltimore is visible through the brush on the right. At the junction the Tide and East Subdivisions met. 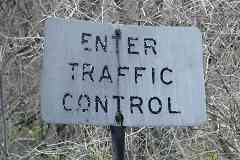 The sign on the left reminded WM trains bound for Port Covington that they were entering a region covered by Centralized Traffic Control. This reverse view at Walbrook Junction finds the Tide Sub tracks in the foreground. 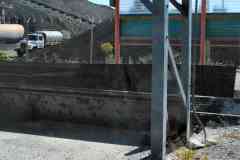 Portions of the line are now continuously welded rail. What remains of the WM's main line into Baltimore on the left is jointed track. We'll follow that next. 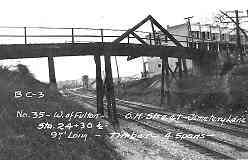 The remainder of this tour page proceeds east from Walbrook Junction along the "Connection" to Fulton Junction where the WM and Pennsylvania RR affiliates had shared a route into Baltimore. The reference point for the "Mile" data below is the present-day milepost 4. 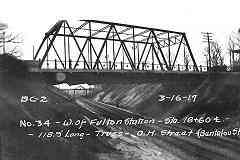 To coincide with the opening the Baltimore & Potomac (B&P) Railroad Tunnel that linked Fulton Junction and Baltimore's Union (now Penn) Station, the WM built on the west side of the city a new main alignment from Owings Mills to Fulton Junction, then leased the tunnel for 10 cents per passenger. 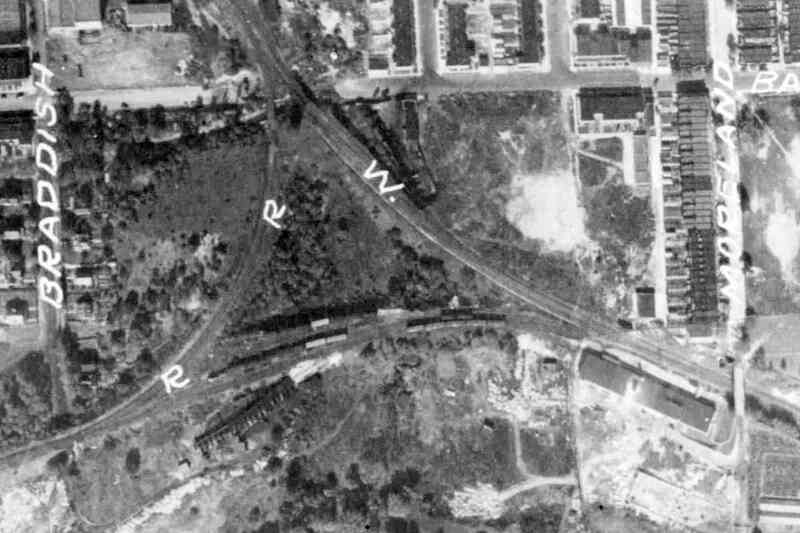 The WM added track on the east side of town as well, to its Hillen Station near what is now I-83 and US 40 (Orleans Street). 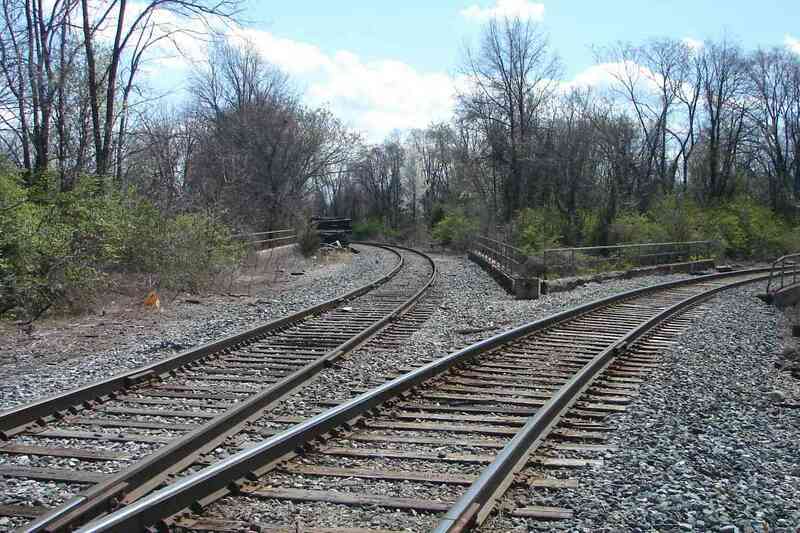 After the WM ended passenger service in 1959, and especially after it merged into the Chessie System, its track between these two junctions became little more than a connection for interchange traffic. 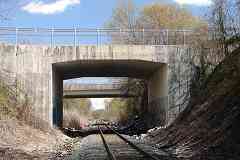 The B&P tunnel remains in use today by Amtrak as part of its Northeast Corridor. 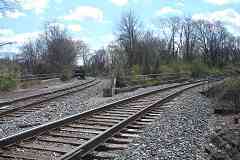 The WM's main line into Baltimore (left) had been double tracked. 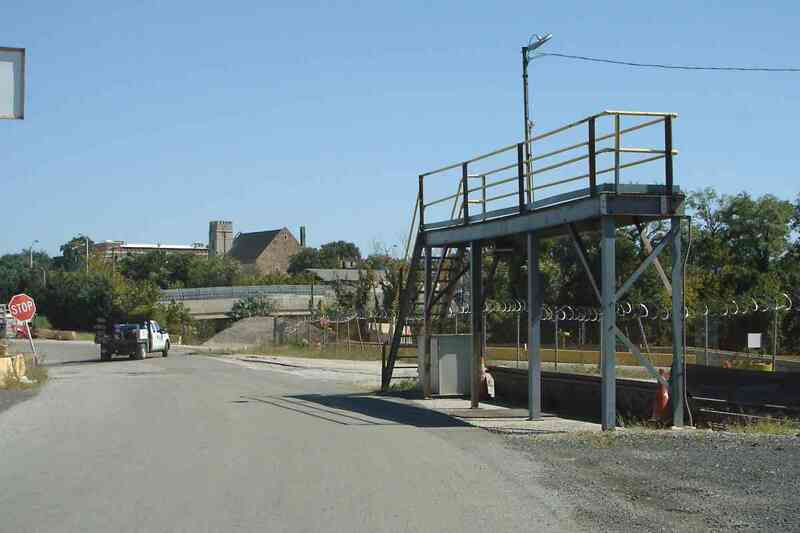 The bridge for it here is 35 feet wide, whereas that for the Tide Sub (right) is just 20 feet wide. A signal had guarded the junction. Note the modular concrete blocks of a shape unique to the WM. They could be stacked to create bases of varying heights. 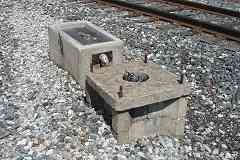 The adjacent box had held a battery as backup power for the signal. 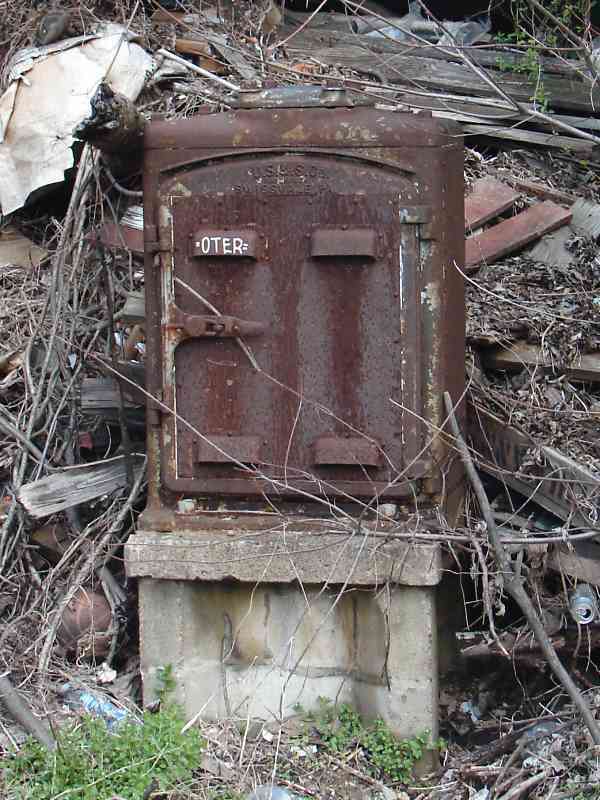 Many of these boxes, now empty except for mice, remain scattered along the line. Rusty jointed rail reveals little recent use. The light green stripe on the right is the south leg of the wye. Looking back (west) along the mound of the south leg shows its rails are no longer present. 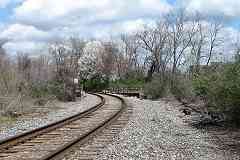 In the past various short storage tracks had extended into the wye, where the trees on the right now meddle. On the left one of these days Emanuel Tire is going to cut discarded automobile tires into little pieces that can be repurposed. Around the world hundreds of millions of tires are discarded annually. 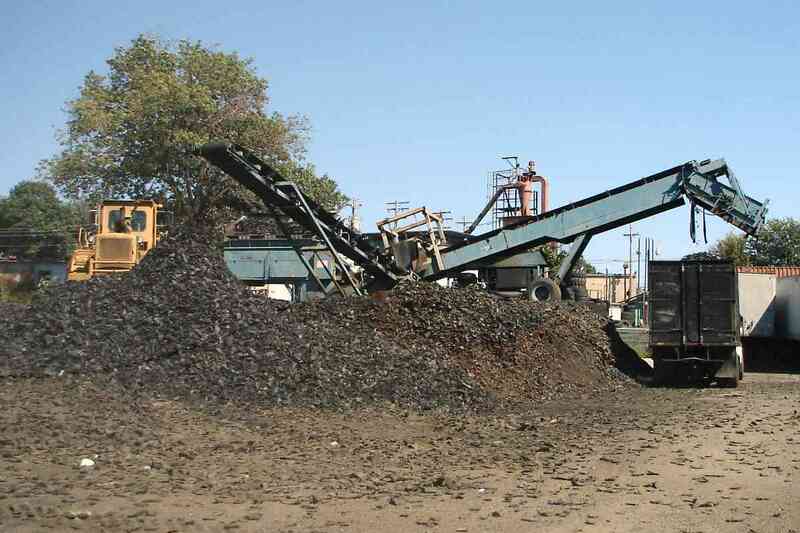 Shredded tires, in the form of crumb rubber, can be recycled into asphalt and concrete pavement. They also landfill more compactly since as small pieces they occupy less space than do hollow tires. Around 1930 a siding was added off the south leg and remained elevated to facilitate unloading of materials by gravity. This disconnected piece of it survives midair. Does it go behind the building? No, it goes through the building, however the roof is too low to permit passage of anything but flatcars, and even that looks tight. Unless someone has a better explanation, it would seem the structure's roof was rebuilt lower than it had been in the past. "In the Walbrook Jct. 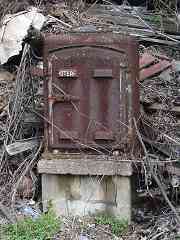 area, those tipples with the rails still on them were for coal dealers. There was a few of them that branched off in the wye area. 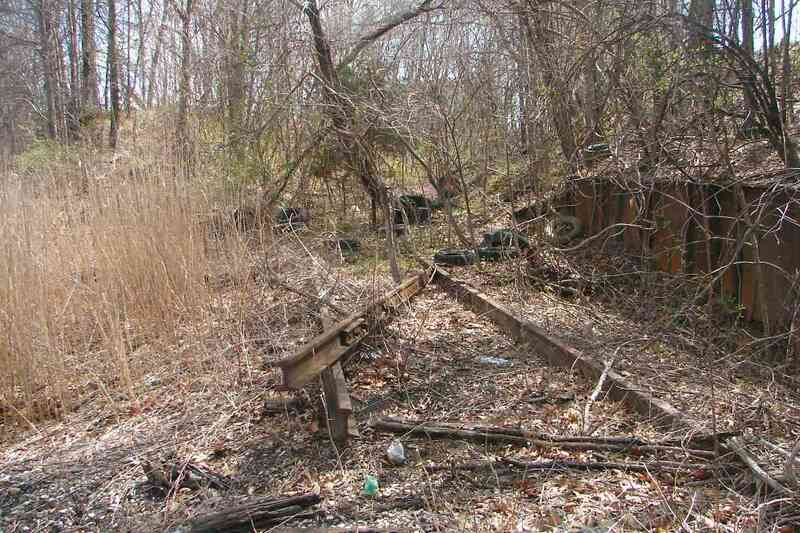 I believe the remains of the siding that was above a building was for the old Drydene Oil Co. which was located at the end of Braddish Ave. after the street went under the wye track. 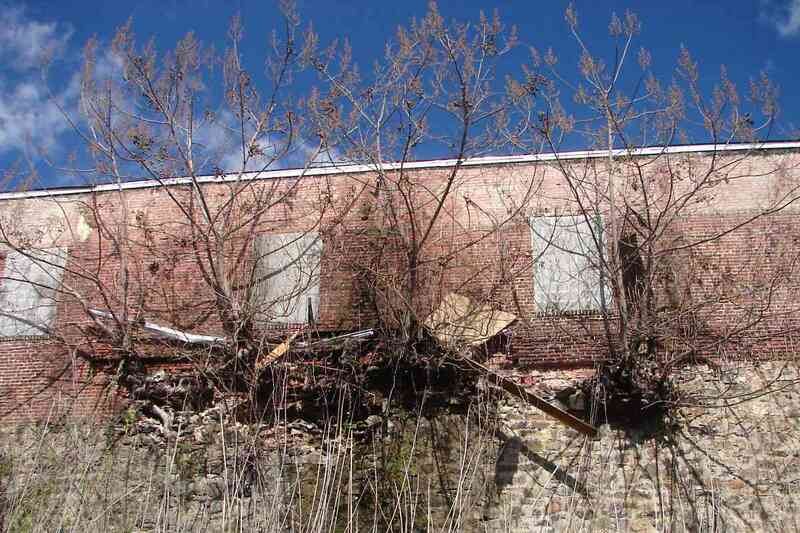 The building was (is) at street level and the siding was above it. I have an old matchbook cover with Drydene's name and address. The address says Braddish Ave. & WM RR. 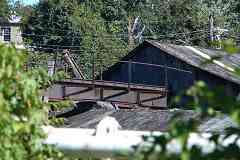 I understand a covered hopper of grain derailed there years ago and dumped its contents all over their building. After that they decided to move the business elsewhere." 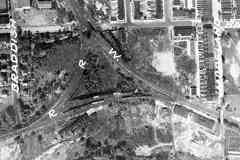 This 1927 aerial shows two trains on short sidings within the wye. 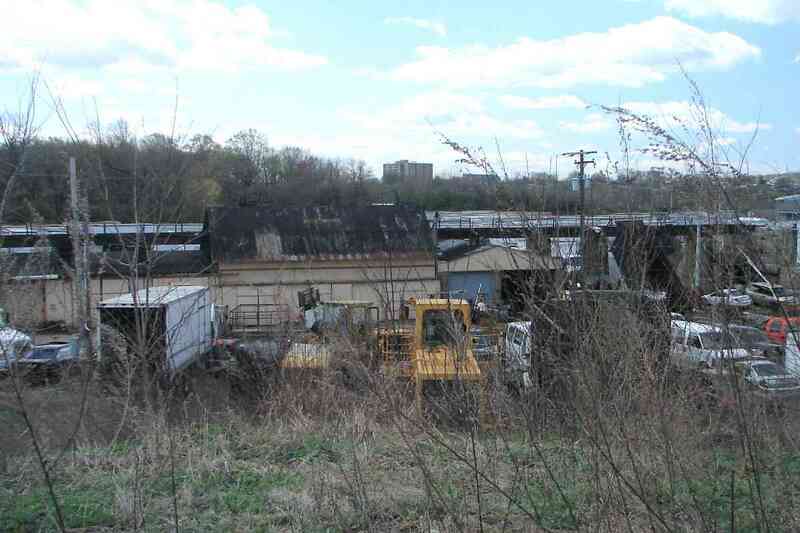 The warehouse-style building trackside on the right is no longer extant. Beyond the switch we find echoes of the WM during its double-tracked glory days. 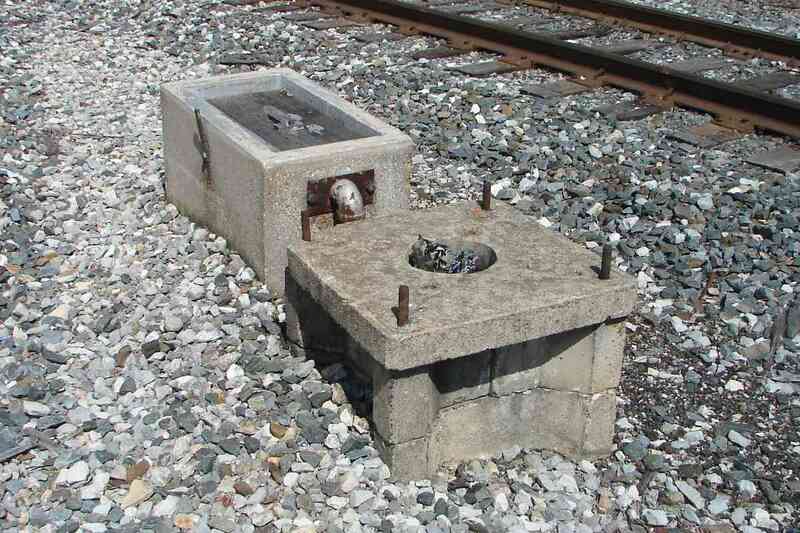 The WM chose Union Switch & Signal to supply equipment, some of which, like this cast iron box, survives trackside albeit in disused form. 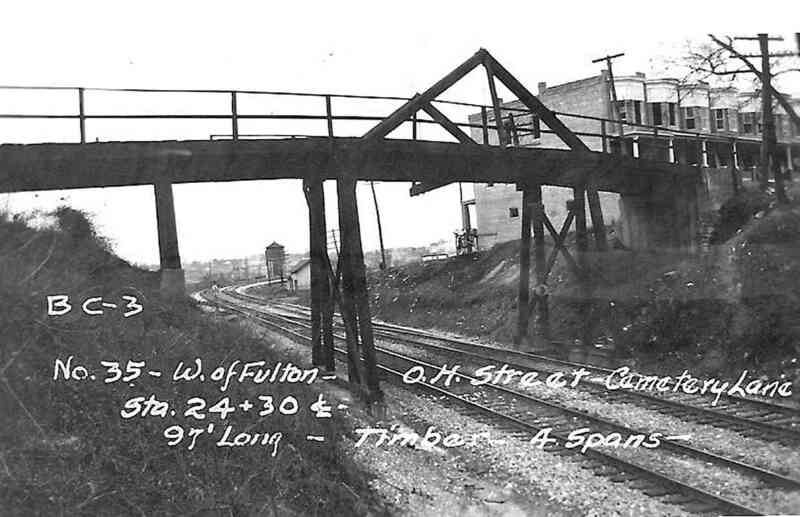 During the early 20th century this timber bridge carried Cemetery Lane, now Moreland Avenue, over the WM. 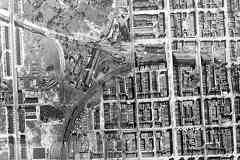 It appears in 1964 aerial photos but not ones from 1972. 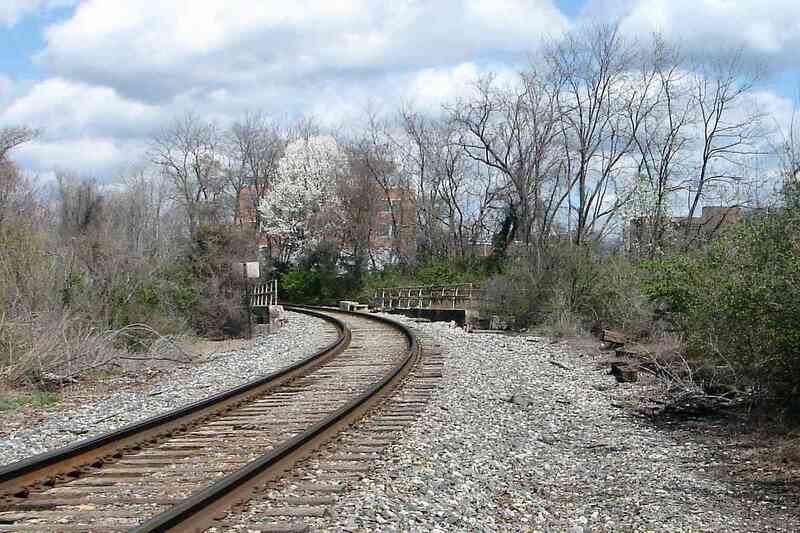 From almost the same spot about 100 years later, the bridge is gone but the tracks and row houses are still present. The busier Bentalou Street qualified for steel even in 1917. That's Moreland Avenue in the distance. Bentalou Street got its name from a French shipping merchant Paul Bentalou who emigrated to Baltimore after serving as a cavalryman of the Marquis de Lafayette during the American revolution. 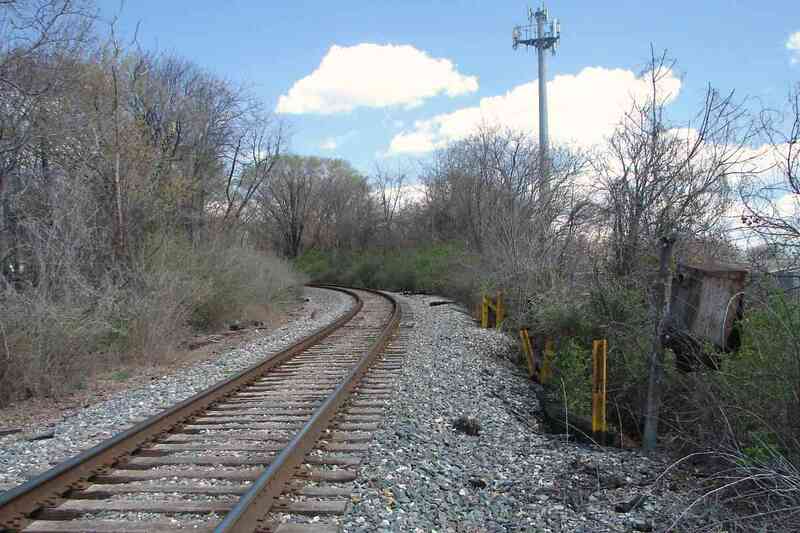 From the same spot about a century later we find only the tracks remain basically as before. 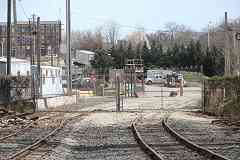 Note the deteriorating trackside fence made of rails and now-rusty panels. Its purpose is unclear, but may have been to limit the amount of trash that spilled onto the tracks. During 1927 the Fulton Wye was busier than the Walbrook Wye: note sidings curving off at several spots. The buildings inside the wye are no longer extant. 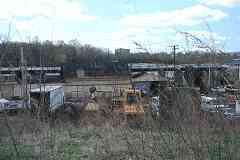 Along the tracks at bottom left that appears to be steam from a locomotive. 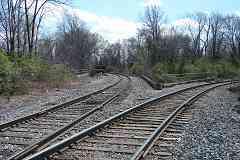 Upon approaching Fulton Junction one finds scattered ties on the right that mark the west leg of its wye. 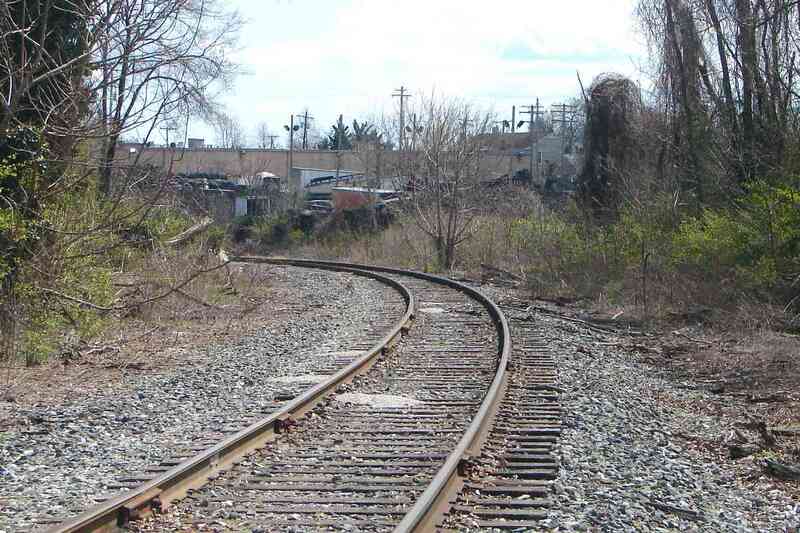 Rails can still be found, hoping to be reconnected. Deep beneath the ground are likely more artifacts. 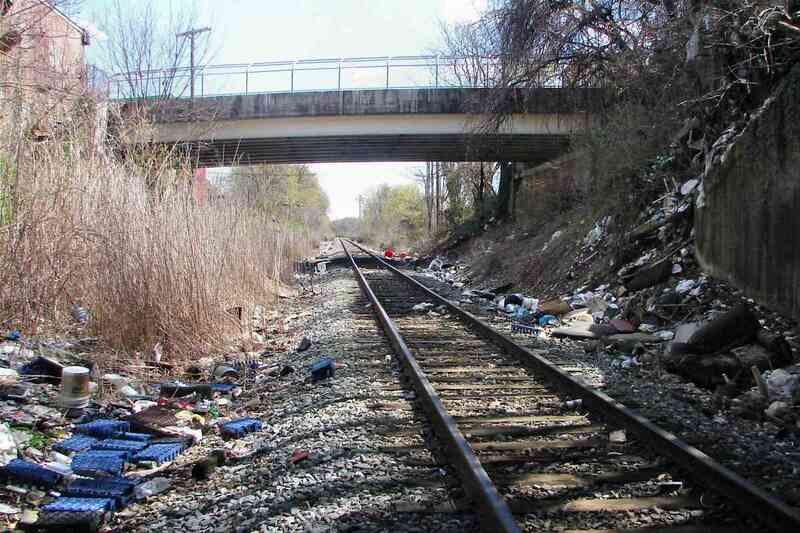 Disconnections here date to the early 1980s as part of Amtrak's Northeast Corridor Improvement Project (NECIP). 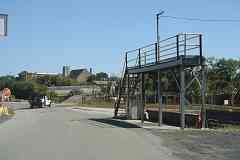 P. Flanagan's materials business now occupies the area of the wye and has gated the WM track. 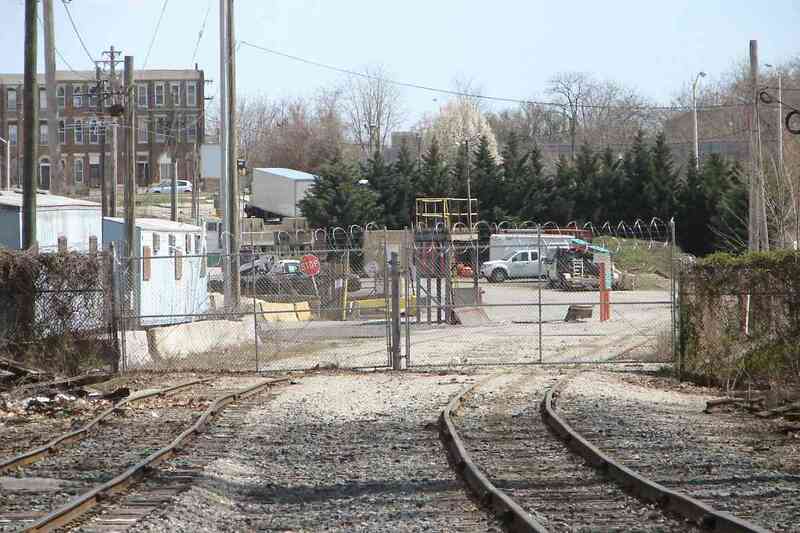 Delivery of bulk materials into the facility by train appears to still be possible -- after the gate is opened of course. 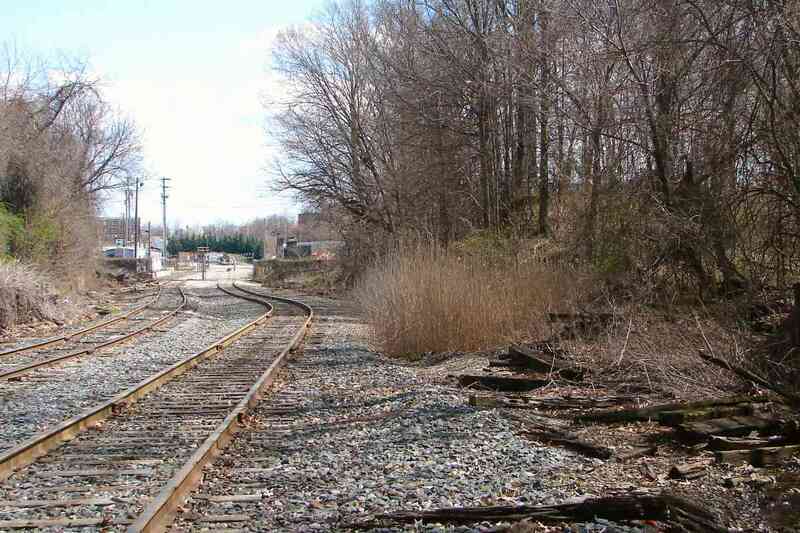 During past decades short sidings had peeled off to the left near the Stop sign. Seamus, that's the dog, was outside on guard duty. The houses at distant left front on Fulton Avenue just north of the cut for the railroad. When it was part of the WM main line the track here did not pass over an unloading dock, but now it does. Bulk materials such as crushed stone are unloaded from hoppers by gravity then pass through a screen and onto a conveyor. Before the 1980s the WM's rails had proceeded past the Stop sign and then under the Monroe Street bridge in the distance to merge with the Pennsylvania RR's alignment for the trip through the B&P Tunnel and onward to the east side of Baltimore. Now they peter out near the truck, and near the former location of the WM's Fulton Station that was demolished to make room for the Monroe Street bridge. 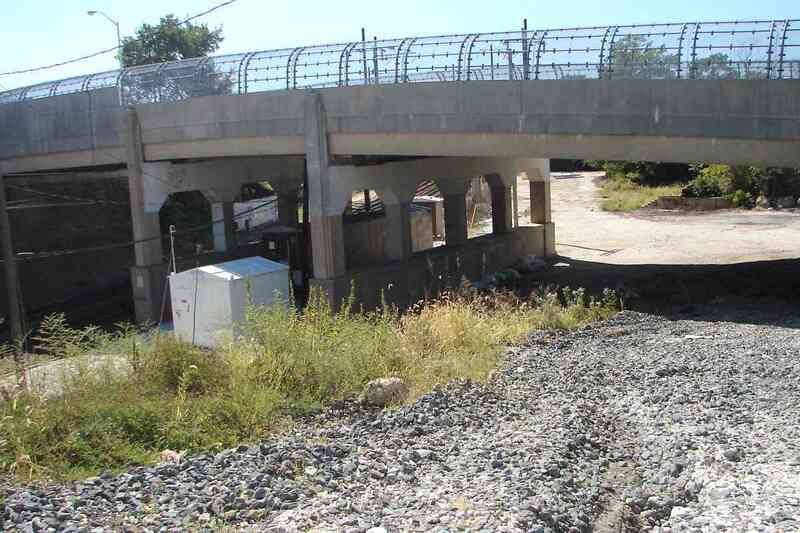 In this reverse view under Monroe Street the WM had run on this side of the closest set of bridge supports, and then joined the Pennsy's trackage behind and on the left. 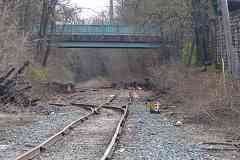 The current Northeast Corridor tracks can be glimpsed through the supports near the center. Significant fences inhibit better photos here. Like the B&O's Howard Street Tunnel, the B&P's Tunnel is an aging bottleneck. 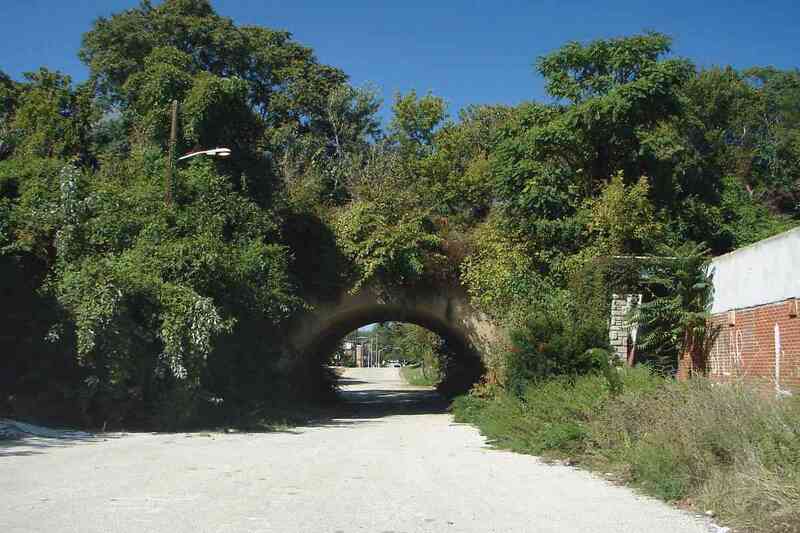 Studies have considered many alternative routes for a new tunnel. 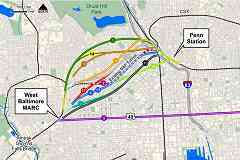 The 2014 report linked below eliminated for further consideration all but routes 2, 3, and 11. 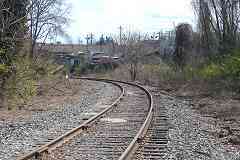 Route 2, which involves rehabbing the existing tunnel, is the only one that can preserve a connection with the ex-WM at Fulton Junction. Rehabbing this tunnel as well as the B&O's Howard Street Tunnel is likely less expensive than building any new route. 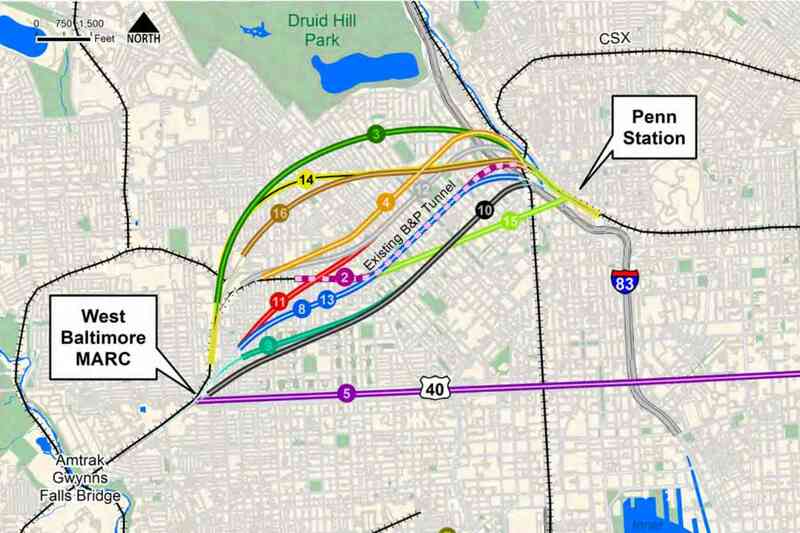 As a temporary bypass while the rehabbing effort is underway one tube of either the I-895 Harbor Tunnel Thruway or I-95 Fort McHenry Tunnel could be adapted for trains. Extensive rail infrastructure already exists near the portals of both tunnels.